Click on book cover see more! 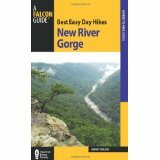 With this book in hand and willing feet you can explore the New River Gorge. No matter where you go, the trails in this book will enhance your outdoor experience and leave you appreciating the natural splendors of West Virginia. Enjoy. The astonishing view stretched deep into the gorge. I stood on the sandstone outcrop. Below me flowed the ancient New River, carving an amazing canyon ever deeper. Frothing rapids echoed off the wooded walls that rose from the bottom. The relics of Kaymoor Mine stood across the gorge. The sheer cliff of the Endless Wall stretched to the yon. Diamond Point was but one of many scenic and rewarding destinations in this guide and encapsulated this marvelous parcel of West Virginia. I mentally reflected on other destinations, recounting all the worthwhile hikes in the New River Gorge National River. To the south, the Bluestone Turnpike led along a designated wild and scenic tributary to a forgotten town. The Big Buck Trail started by one of the many exciting rapids of the New and climbed into a wildflower-filled vale. Gwinn Ridge Trail traversed a lonely ridgetop, where wildlife from bears to deer can be seen. Glade Creek, another tributary of the New River, held towering forests along a trout-rich stream with waterfalls, cascades and swimming holes. Appropriately named Grandview presented quiet woodland treks, along with spectacular vistas from the canyon rim and geological formations aplenty. Still other trails led alongside the New River, presenting a serene face in its quiet pools, separated by booming whitewater rapids that drew in kayakers and rafters from hundreds of miles. Water accesses were numerous for the gorge hikers, whether on the Stone Cliff Trail, Southside Trail or others. Beaver Creek was but one of several West Virginia state parks that added quality hikes to this guide. The views from Hawks Nest State Park amazed! The hikes there visited cliffs, boulders, waterfalls, and included a tram ride in season. Babcock State Park contained a hike that started near an interesting grist mill, then climbed to a stone pillar and on to the back of beyond. And what would the New River Gorge be without coal mining history? The national park service has done a stellar job in preserving this area’s past. Visit the town site of Red Ash, where you can find evidence of its past amid a forest which has reclaimed the site. The Rend Trail traveled an old railroad grade connecting mining facilities. I could see Brooklyn Mine, and the closed shaft and nearby ruins. The entire mine and community of Nuttallburg are on the National Register of Historic Places. It has been preserved and enhanced with interpretive information that brings the past to life as you walk through it. The Kaymoor area near Fayetteville has several hikes detailing not only the past, but also natural beauty that can be well appreciated from places like Long Point. Here, you can also overlook the famed New River Bridge, the largest suspension bridge in the country. The yell of rafters far below Diamond Point brought me back to the here and now. And yes, not only can you hike the New River Gorge, but raft, kayak, camp, climb and fish. It is truly a national treasure.